1. To make dressing, combine broth, vinegar, olive oil, sugar, mustard and garlic in a small sauce pan and bring to a boil. Remove from heat and keep warm. 2. To make tortilla bowls, place each tortilla into a 7 inch metal or glass oven proof bowl; set each bowl onto a large baking sheet. Bake at 400 degrees F for 10 minutes or until crisp. Set aside. 3. 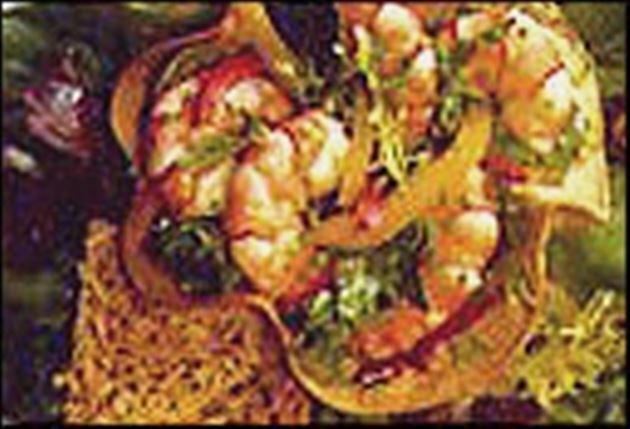 To assemble, combine shrimp, bell peppers and half of the greens in a large bowl. Pour warm dressing over salad and toss. Place 1 cup salad mixture into tortilla bowls and sprinkle with chives. Place remaining greens on serving plate. Enjoy this delicious tortilla shrimp salad Mexican recipe!